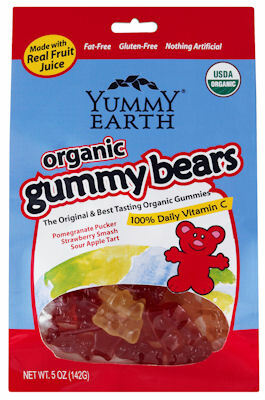 There are certain traits each of their products share, including all being certified USDA organic (the first of its kind for gummy bears or gummy worms), manufactured without corn syrup, and stamped with a variety of allergen-free ingredients. Note that the Parve (a specific designation of Kosher) certification displayed on their website applies only to their hard candy, as the gummies contain gelatin (presumably an un-Kosher gelatin), which is also why the hard candy is certified vegan and the gummies arenâ€™t, so youâ€™d do best check the specifics on each bag for the slight variances. Organic Candy Drops: All these pieces were shaped at about a half-inch diameter. The bag I received came in fourish flavors, which all remind me of hard candy sticks in terms of flavor and smooth surface. Wet-Face Watermelon: is the pink piece. It bears a refined watermelon taste with a slight burst of tartness. Itâ€™s not really watermelon, and as someone who dislikes watermelon in candy, I enjoyed that. Mango Tango: this piece is half-orange, half-yellow. The citrus here is zestful, but more indicative of lime, lemon, and orange than mango. I am not sure what flavor is doing the tango with the mango, but itâ€™s very confusing in a delicious and flavorful way. Not really mango, but tasty. Cheeky Lemon: this piece is the full yellow drop. The lemon flavor is more tart than zestful, but in an understated manner that lets you appreciate the charm of a lemon. I donâ€™t really notice the cherry notes hidden under the potency of the lemon flavor. Pomegranate Pucker: is the deep-purple piece. I have to say I enjoyed the other flavors, but wasnâ€™t bowled away until this one. Wow! The pomegranate juice notes are strong with an alcohol base flavor profile that is robust, complex, and deep like a woodsy wine. Notes of black currant and grape juice reveal themselves, and I am reminded of the black currant piece in Rowntreeâ€™s Fruit Pastilles, a product I lauded to no end. Of all the things the kind folks at Yummy Earth sent me, this was the best. 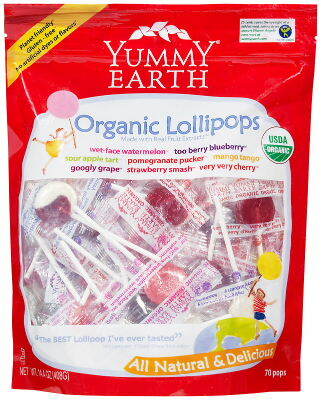 Organic Lollipops: come in eight different flavors, including three of the flavors found in the candy drops. Each lollipop is about an inch in diameter and labels its flavor on the wrapper (the candy drops did not do this, hence why I mentioned their colors). In terms of the repeating flavors (Wet-Face Watermelon, Mango Tango, and Pomegranate Pucker), each resembles the flavor and smooth consistency found in the candy drops, except the pomegranate is not as bold here. Strawberry Smash: like the watermelon, this is comprised of a muted strawberry flavor, relying on the taste of strawberry in an altered state, such as a jam or fruit leather. It too reminds me of the strawberry piece in Rowntreeâ€™s Wine Gums. This piece refrains from being to sweet and lets the flavor speak instead of sugar. Very delicious. Sour Apple Tart: I believe this piece is more tart than it is sour, the way a Granny Smith apple isnâ€™t really sour. The apple flavor is reminiscent of freshly squeezed juice and is spot on for what it is trying to convey to your taste buds. Very Very Cherry: there are so many types of cherry flavors, and this one is more along the lines of a cherry juice or the tart quality found in sour cherry pie. Those who are fans of that sort of cherry will enjoy this. Googly Grape: Iâ€™d wager that this is the most traditional of the flavors. The taste is approximately that of grape juice, but not nearly as sweet. Itâ€™s mild like a grape popsicle, but genuine in itâ€™s flavor presentation. Tooberry Blueberry: blueberry is a hard flavor to reproduce in a candy, and these guys do pretty well here for the most part. Like their other flavors, it tastes more like the fruit juice than the fruit itself. I am not quite sure what the white flavor swirling the blueberry is (cream perhaps? ), but I would prefer this lollipop without it. Gummy Worms: For those of you accustomed to eating gummy worms, please not that these are about half the size of a traditional worm. I would also say they look a little more snake-like than worm. Regardless of size or shape, they are highly fragrant and provide a 100% daily dose of vitamin C.
Sour Apple Tart: in gummy form, the sharpness of the apple flavor in the lollipop is mutedâ€”but this is a great thing. The taste is pure apple and works well with the firm, but easy to chew texture of the gummy. Best of the three flavors. Pomegranate Pucker: oddly enough, this version of the pomegranate flavor differed from that of the candy drop and lollipop. Tangy Tangerine: tangerine isnâ€™t a popular gummy flavor, but Iâ€™m not sure why, since it works well here. The citrus component is far from subtle and has a great tangerine zest, but it does seem more like orange than tangerine. Gummy Bears: these are akin to Haribo gummy bears in shape, but not as defined. 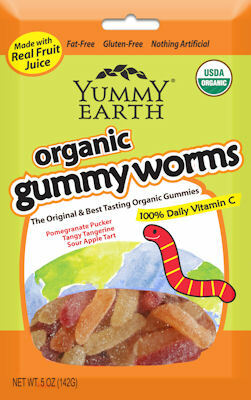 Like the gummy worms, they too boast a 100% daily dose of vitamin C. I also noticed the gummy chew was a bit firmer in these, which is a nice contrast from your typical flabby gummy. Sour Apple Tart: the gummy quality is definitely playing a role in reducing the same flavors that are in the hard candy. Even more so than the worms, these lost that tartness in the lollipops. I think the reduced intensity worked well in former example, but here itâ€™s just too subtle. Pomegranate Pucker: not really a surprise, but the pomegranate flavor here is completely different than any of its other manifestations reviewed so far. Had I not known these were pomegranate, Iâ€™d probably guess grape. Strawberry Smash: this bear in particular stood out. More so than the others, the chew factor played out well. The strawberry flavor mirrors that of the green bear in the Haribo variety (yes, green is strawberry in Haribo land), but does so in a much more flavorful and natural way. Best in this bag. Aside from offering a great array of flavors in some better-for-you ways, one thing I really enjoyed about these guys was that the hard candies came in resealable bags; not sure why the gummies didnâ€™t as they would need it more, I would think. For those of you who, like me, enjoy certain flavors more than others, you can purchase the majority of these in individual flavor bags, as opposed to the mixed variety I sampled. All in all, I think these are actually tasty. I donâ€™t say that in that â€œhealthy candyâ€ tasty way, but tasty for any type of candy. Certain pieces here are just spectacular, and I would easily purchase those on their own. In a testament to how good they are, I actually handed them out for Halloween and received a variety of compliments from my neighbors; in the better-for-you candy world, your toughest critics are kids, and Yummy Earth easily made them smile. Kids in many parts of India eat jagerry and stuff made with a delicious combination of jaggery and nuts. Great during winders. Jaggery and nuts, that sounds very healthy. What is Jaggery? These really look worth trying. I’ll have to check around for them. I’m not sure I want to go down the “good for you”/”not good for you” candy path. I mean, it’s candy. 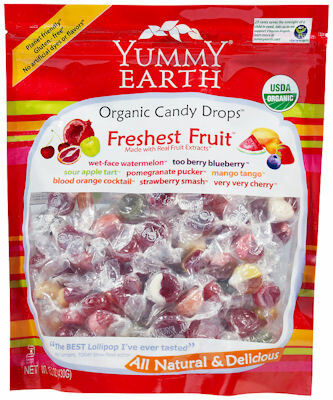 But I definitely think these Yummy Earth flavors are so so so tasty. And if you’re gonna eat candy, I think the tastier the better. These days, I’m a little unclear on the distinction between “natural” and “artificial” flavors, as “natural” is not the same as “squeezed from the fruit,” as I understand it (Fast Food Nation has an interesting discussion of this issue). But still, whatever a “natural” flavor is, it is such an improvement! pareve is not a specific designation of kosher. pareve means that there is no meat or dairy products in it making it acceptable to vegetartians and those who are lactose intolerant. An item that is not kosher could be considered pareve if it contains no dairy or meat. @ Alyssa, I don’t remember saying this was new candy as much as I believe I was alluding to this being a new market for candy. Sorry if I gave the wrong impression (all of our new candy is actually tagged with that designation, which is why I didn’t tag it). Also, in regards to parve, yes and no. True, something need not be kosher to be parve, i.e., sharks are considered parve, but they are not kosher; however, the comment was specifically made in regards to the symbol stamping it as kosher, as a parve subcategory. In the food world, when something is labeled as parve, it is in reference to whether it is kosher, not whether the item is or isn’t parve on its own right. Oh sorry i thought that we were talking about candy because i LOVE candy! I also LOVE CHOCOLATE!!! hi. you wrote “The latest comes from Yummy Earth” which infers to me that it just came out. Regarding pareve-a company could put pareve on a non kosher product but they wouldn’t b/c it means nothing to them. I know a little something about Yummy Earth and it is Kosher. They label it Kosher parve to designate which category. Just because 2 things may be Kosher, does not mean you can eat them together. I personally don’t keep kosher so i’m no expert but there are certain foods that can’t be combined on the same day. Great, detailed review of their products. I look forward to trying them sometime. Organic gummy candy tends to taste weird. I’m surprised that the same flavors had so much variation between forms.